A recent study published by The American Journal of Clinical Nutrition found that higher intakes of omega-3 fatty acids during pregnancy reduce the risk of childhood obesity by as much as 32%. The study also found that children with a higher ratio of omega-6 to omega-3 fatty acids had a two- to four-fold increase in the rate of obesity. This study adds more evidence to the growing body of research that insufficient intakes of omega-3 fatty acids can have adverse effects. It also underscores the importance of achieving a healthy balance of omega-3 and omega-6 fatty acids in your diet. Omega-3 refers to a group of unsaturated fatty acids (linolenic acied, eicosapentaenoic acid (EPA) and docosahexaenoic acid (DHA). Omega-3 fatty acids are classified as “essential fatty acids” because they cannot be made (or only made in limited quantities) by your body. Therefore, they must be obtained from your diet or in supplement form. Foods such as rapeseed, soybeans, alfalfa, cold-water fish, wild game and walnuts contain omega-3 fatty acids. Omega-6 is another essential fatty acid your body needs but it must be in a balanced ratio with Omega-3 fatty acids to be healthy. Omega-3 fatty acids help reduce inflammation while some omega-6 fatty acids tend to promote inflammation. Most nutritionists suggest that we should consume between a 1-1 and 4-1 omega-6 to omega-3 ratio. Dietary sources of omega-6 include vegetable oils such (linoleic acid) and other plant based oils such as evening primrose oil and borage oil (gamma-linolenic acid) or GLA. Unfortunately, the typical American diet tends to contain 14 – 25 times more omega-6 fatty acids than omega-3 fatty acids, which many physicians consider to be too high on the omega-6 side—and potentially unhealthy. In fact, this extreme imbalance is often blamed for the high rates of obesity, heart disease, cancer and other diseases that are more prevalent in those that consume a “western” diet. By contrast, the Mediterranean diet has a healthier balance between omega-3 and omega-6 fatty acids. Many studies have shown this diet promotes cardiovascular and over-all health. The Mediterranean diet emphasizes foods rich in omega-3 fatty acids, including whole grains, fresh fruits and vegetables, fish, olive oil, garlic, as well as moderate wine consumption. This research sought to determine whether a mother’s fatty acid consumption affected their child’s chances of being obese. Obesity is defined as weight that exceeds 15 percent of normal weight for height and body type. Morbid obesity exceeds 20 percent of optimum weight. Obesity in adults has been linked a number of serious health problems, including heart disease, high blood pressure, stroke, varicose veins, dementia, psychological stress, depression, osteoarthritis, high cholesterol and diabetes. The study included 1,649 mother-child pairs. Researchers assessed mid-pregnancy intake of omega-3 (DHA and EPA) and omega-6 fatty acids and maternal plasma fatty acid levels. They also measured umbilical cord levels of omega-3 and omega-6. The children involved in the study were then assessed at age 3 to determine body mass index (BMI) and skin fold measurements. Researchers found that about one fifth (1/5) of expectant mothers consumed two or more fish meals per week at mid-pregnancy, but only half of those women achieved the recommended 200 mg of DHA per day. Researchers also found that only three percent of women consumed the recommended intake of DHA in the last month of pregnancy when large amounts of DHA are transferred from the mother to the child to support brain development. After the follow-up with the children, it was found that the odds of obesity in 3 year olds were between two and four times higher when cord blood had a high ratio of omega-6 to omega-3 fatty acids. The odds of childhood obesity were 32 percent lower when maternal intake of omega-3s was high or if the ratio of omega-3 to omega-6 was near the recommended levels. 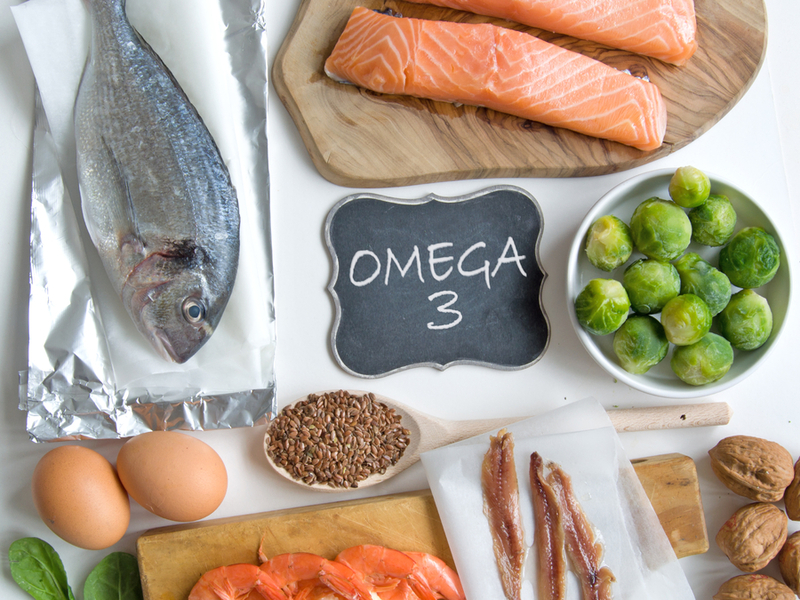 Although these findings need to be confirmed with future studies, it appears that increased omega-3 intake and reduced omega-6 intake during pregnancy may lower the risk of future obesity in children.